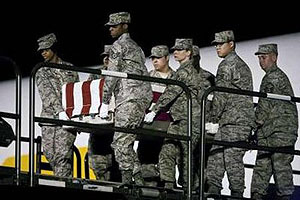 For the past 18 years the press has been banned from attending the arrival ceremonies of deceased soldiers at Dover Air Force Base. Last night’s ceremony was a landmark occasion. But now that the ceremonies are likely to be open so often, there’s little guarantee that the press will regularly come out in such force. Yeesh. It’s disrespectful when the press shows up and it’s disrespectful when they don’t. Sometimes you just can’t win. 1More likely reason: Following the invasion of Panama in 1989, George Bush Sr. got pissed off when pictures of coffins arriving at Dover were inadvertently broadcast live on a split screen while he was laughing with reporters at a press conference. Two years later, he made sure that wouldn’t happen again.